state's summer-grown crops, based on August 1 conditions, shows an increase from last year's production, according to the August Crop Production report issued by USDA-NASS today. Wheat production is forecast at 155.4 million bushels, unchanged from last month but up 121 percent from last year's production. An average yield of 37 bushels per acre is expected from 4.2 million harvested acres. Production of corn for grain is forecast at 33.0 million bushels, is up 93 percent from last year. An average yield of 100 bushels per acre is expected from 330,000 harvested acres. Cotton production is forecast at 220,000 bales, up 153 percent from 2011. An average yield of 556 pounds per acre, the lowest yield since 2006, is expected from 190,000 harvested acres. Production of grain sorghum is forecast at 5.0 million bushels, up 200 percent from 2011. An average yield of 28 bushels per acre is expected from 180,000 harvested acres. Peanut production is forecast at 91.0 million pounds, up 53 percent from last year. An average yield of 3,500 pounds per acre is expected from 26,000 harvested acres. Soybean production is forecast at 5.80 million bushels, up 68 percent from 2011. 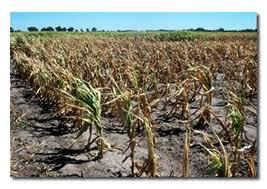 An average yield of 20 bushels per acre is expected from 290,000 harvested acres. Production of all hay is forecast at 3.64 million tons, up 56 percent from last year. Alfalfa production, at 400,000 tons, is up 54 percent from 2011. Production of all other hay is forecast at 3.24 million tons, and is up 57 percent from last year. Nationally- it's clearly a different story as drought has caused US farmers to be facing a 13% drop in Corn production and a 12% decrease in soybean production nationally compared to 2011. The US Cotton crop is faring better than a year ago- up 13% from 2011 while the winter wheat production number was adjusted slightly from the July Crop Production forecast- up one percent nationally. Dr. Kim Anderson of OSU says that he is not surprised by the corn or soybean numbers nationally- and that it will take a couple of days for the impact of this report to be fully reflected in this report. Click on the LISTEN BAR below for our full conversation with Dr. Anderson from Friday morning.